Bolivia Rising: Bolivian Foreign Minister: "Communitarian Socialism will refound Bolivia"
Bolivian Foreign Minister: "Communitarian Socialism will refound Bolivia"
The new Political Constitution of the State, approved by referendum on the 25th January by 61.4% of the votes and announced on the 7th February, is clearly of transcendental importance for the refoundation of Bolivia. Essentially, it establishes the creation of “a Unified Social State of Law whose character would be Plurinational Communitarian, free, independent, sovereign, democratic, intercultural, with decentralized autonomous departments, regions, municipalities and indigenous circumscriptions”. The recognition of individual and collective rights, popular participation, the principle of equality, and the end of all types of exclusion and discrimination are all present in the new constitutional text. This triumph of the democratic revolution lead by the government of Evo Morales was won by huge mobilizations by the Bolivian people and a clear show of force by the Executive to neutralize the Oligarchy’s putshist attempts, which were so clearly supported by US imperialism. The same fortitude is now required to achieve the approval of transitional laws and regulations in a Congress with an opposition majority. Without this measure, many changes in the new Constitution will remain on paper alone. Or rather, they will oblige the President of the Republic to permanently resort to supreme decrees. However, citizen rights and legal defence resources automatically came into effect, since they do not require any special laws. Following its constitutional mandate, the Bolivian government sent Congress project to modify the previous electoral laws and call for general elections on the 6th December of this year. Bolivians will be able to reelect the President and Vice President of the Republic for a new period that will end in 2015. In April of next year, there will be another national election for municipal and prefectural (gubernatorial) authorities. The Bolivian electoral calendar also includes a plebiscite in June of this year, in the departments of La Paz, Oruro, Potosí, Cochabamba and Chuquisaca, to approve the creation of autonomous local governments. These regions had voted No to autonomy in 2006. And the departments of the “half moon”, which already approved autonomy -Santa Cruz, Beni, Pando and Tarija-, must now adapt their statutes to the constitutional norm. In addition to approving the new Carta Magna, the Bolivian people, via the referendum, also rejected the latifundio, in a country in which 91% of cultivable land is in the hands of latifundistas (large landowners) allied to the political Right. 78% of voters decided that the maximum extension of individually-owned land must not exceed 5,000 hectares and only 22% chose a limit of 10.000 hectares. It was about these subjects, but also about the democratic revolution’s more long-term projections, that PF spoke with the Bolivian Foreign Minister, David Choquehuanca. Due to his many obligations both within Bolivia and abroad, the interview was carried out in two parts – one a few days before the Constituent referendum and another after this. What are your priorities in the process of implementing the new Political State Constitution? “One of the priorities is that the Parliament should work on the law for the election of President and Vice President of the Plurinational Legislative Assembly. Another priority is regulating Bolivians’ right to vote abroad, and obviously, ensuring that Bolivians are aware of the rights established by the new Political Constitution, because many people are unaware of them. We are adapting the structures of the Executive Office in order to achieve the aims of the plurinational State. And as a Ministry, we must develop a new foreign service law that is consistent with the Constitution”. “There are certain powerful groups and individuals who wanted no part of the Constituent Assembly proposed by the new Constitution. They did not want a participatory democracy. 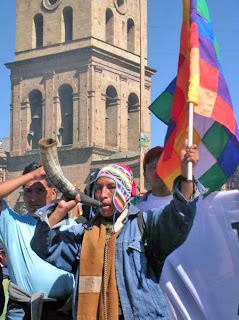 These are the people who opposed Evo Morales since the day he was elected, since the indigenous peoples marched in demanding greater participation and the construction of a new, more inclusive, less discriminatory Bolivia. But they will continue to create obstacles. They have organized themselves into political parties, and civic committees, and despite the Bolivian people giving a clear message that they don’t want the latifundio, these long-privileged latifundistas are still unable to see it, and are working hard to stop this process from consolidating. But the majority of the people, not just the indigenous campesino movement, has voted against the latifundio, even in Santa Cruz, Beni and Pando. This is a message that they must be able to read. That is, people don’t want the latifundistas to continue running the country. I think that the Bolivian people will overcome those obstacles, just as they did with the mobilizations that facilitated the Constituent Assembly. These groups used Young university students in an attempt to sabotage the Constituent Assembly, but the people organized themselves to overcome this. Then there was an attempt to oust our president by calling for the recall referendum. Once again, the people organized and responded with great maturity, ratifying president Evo Morales with more than 67% of the vote. The Opposition didn’t accept the text of the new Political Constitution of the State, but the people ratified it by majority vote. Now they are organizing again to block the December elections, because they know that President Morales will win with more than two thirds of the vote. The Bolivian people are very conscious of the results that they have achieved in only three years of government. There are various measures we could cite, such as the el bono Juancito Pinto voucher (a monetary incentive to prevent truancy), or the Renta Dignidad -‘Dignity Pension’ (a monthly stipend to those over 60 years of age, whether they are retired or not). What took twenty years to carry out in roads and infrastructure we accomplished in just three. The Bolivian people know this, and are informed of the democratic revolution’s accomplishments. The conspiracy to destroy this process will not work. How does the concept of the unified Plurinational State combine with autonomous authorities and self-government? “There has always been self-government, autonomous entities. In some places, there are even organizational forms that have been maintained for 500 years. This process, together with the new Political Constitution of the State, recognizes these autochthonous forms of organization. In the framework of a unified plurinational State, it all forms part of a single State entity. It’s like the wilpala (national emblem de la Andean culture which brings together the seven colours of the rainbow, showing the coexistence of all the original peoples). The autonomous entities are represented by the coloured squares, but they are part of something bigger, which is the wilpala. That’s how it is. We are a plurinational State, in which the autonomous entities make up diverse attributions in each department, but that doesn’t mean that they can administer their natural resources only for that department. Our natural resources are the property of the Bolivian people, of the Bolivian State. It’s the same with the national symbols. There are regional symbols which the plurinational State recognizes, values and respects. The different languages we speak in the regions are being revalued, respected and promoted. This process consolidates the autonomous entities, whether this be departmental, municipal or indigenous autonomy, but always within the framework of national unity”. How would you characterise the communitarian socialism that democratic, cultural revolution is attempting to build? “We indigenous peoples have taken steps towards the recovery of our values and principles. We are heading towards the pachakuti (rebirth or return to balance, between people, and between people and nature) and on this path, as we incorporate our values and principles, we have begun to speak of communitarian socialism. We have adopted various socialist principles. It must not be forgotten that we seek to ‘live well’, not only to ‘live better’. For capitalism, the most important thing is money, and life is of no interest to it. The basic law of capitalism is the accumulation of profits. This is why we disagree with capitalism. Socialism has shown us another way. In socialism, the most important thing are human beings, and so it seeks the satisfaction of their ever-increasing needs, both materially and spiritually. For us indigenous peoples, the most important thing isn’t money, or even only human beings. The most important thing for us is life. In the first place is mother earth –our mother nature-, then the plants, animals, stones, stars, rivers, lakes. And finally, there is the human being. We want harmony between humans and nature. We agree with socialism in many ways. We want the fulfillment of people’s basic necessities and wellbeing, but our struggle doesn’t stop there. When we talk of communitarian socialism, we are incorporating the search for a balance within oneself, of ourselves with our environment, with other human beings, with our families and with everything that surrounds us. This is why we speak of tackpacha, which means ‘everything that exists’. We also want to gradually incorporate the return to the pacha (earth) and we speak of jacha uru (‘the great day’). When we speak of communitarian socialism, our message is: we want to incorporate the communitarian element, not only for human beings, but for everything”. In what way will you implement the Bolivian people’s wish to limit landholdings to a maximum of 5.000 hectares? “The people voted overwhelmingly against the latifundio. With the implementation of the new Political Constitution of the State, new acquisitions cannot exceed 5.000 hectares, and the pre-existing ones which exceed 5.000, 10.000, 40.000 or even 100.000 hectares, must be subject to a review and regulation process which is there in the current law. Businesses must be able to show that they fulfill a socio-economic function. Otherwise, the State will confiscate these holdings. According to the relevant sources, in Bolivia there are no businessmen with more than 15,000 hectares who fulfill a social or economic purpose. After receiving the people’s message, the latifundistas should respect the laws that they themselves have ratified. The INRA law (National Institute for Agrarian Reform) which establishes a regulation process, was approved during the administration of Gonzalo Sánchez de Lozada. Its objective was the review of 60,000, 70,000 or 80,000 hectares of land in favour of the big landowners, since the authorities in this case were manipulated by the economic elites. Now this is no longer the case. Also, in the process carried out by the previous government there was a lot of corruption. Each hectare reviewed cost them almost 10 dollars whereas it cost us 1 dollar. Our government will carry out a transparent regulation process”. What role have the social organizations such as the United Confederation of Bolivian Campesino Workers (CSUTCB) and the National Federation of Indigenous and Campesina Women, “Bartolina Sisa” played in the process that you are leading? “We organize ourselves in the communities. In Bolivia there must be around ten thousand communities, and in each community there is a union of campesino workers. Each union has a base which is associated first on a provincial level, and then on a departmental and national level. The national level is the CSUTCB. They’re not naturally existing organizations, but organizations that helped allowed us to table our demands and participate in elections. There are various organized sectors with similar structures, such as the teachers, the miners, the indigenous groups, women, factory workers. And we have a mother organization which is the Central Obrera Boliviana (COB). These are the people’s organizations. President Evo Morales has called for strengthening them, since they are the agents driving this process of change. In these spaces we discussed Bolivia’s political situation and the policies implemented by the neoliberal parties. It was amongst these organizations that the ISP (Instrumento Político por la Soberanía de los Pueblos – the forerunner of the MAS party) was born. It was not the fruit of a meeting between four or five intellectuals. Organizations such as the CSUTCB, the Confederated Union of Land Settlers, the CIDOB Union of Indigenous Peoples and the National Federation of Indigenous and Campesina Women, “Bartolina Sisa” called for a conference on Land & Territory in 1995. And it was here that the proposal to build our own political instrument was born”. Do you see the seeds of a people’s government in Bolivia? “We have always governed ourselves in our communities. This is why we maintain our customs, perform our own music, speak our own Aymaran language, in spite of a 500-year effort to erase these things – our music, our language and our culture. In a state of clandestinity, we have upheld our values, economic forms, our own types of communitarian organization, which are all being reappraised now. This is why we are incorporating into socialism something that has resisted for 500 years - the communitarian element. We want to build our own socialism. Only days after the ratification of the new Bolivian Political Constitution, the government faced unexpected problems such as the accusation of serious corruption against the ex- president of the state oil company YPFB, Santos Ramírez, who was also an ex-senator and a distinguished politician in the Movimiento al Socialismo (MAS). The President fired him immediately, in consonance with his determination to combat corruption, especially within the state. Ramírez is currently in prison awaiting justice. With the same determination, Evo Morales instructed minister David Choquehuanca on March 9th to inform the US embassy of the expulsion of the diplomat Francisco Martínez, for having conspired with the opposition in September 2008 during the anti-government revolts. For this same reason, the US ambassador Philip Goldberg was also expelled from the country last September, accused of supporting and financing the so-called “civic coup”. Few people in the Bolivian government are as close to President Evo Morales as the minister David Choquehuanca Céspedes. Both of them are Aymaras, and are the first indigenous people to occupy government posts. They are both of campesino origin and met each other when very young, Evo as a cocalero union leader and David principally involved in training future leaders. This was in 1984, during the first conference of Young Aymaran campesinos in La Paz. “There were 400 of us and we eventually carried out a march, The press was present, but they went straight to see Evo Morales, and not ourselves who had actually organized the event”, says Choquehuanca, smiling. “The president has ‘something’ about him”, David concludes. Bolivia’s current foreign Minister was born 47 years ago in the community of Cota Cota Baja, on the shores of Lake Titikaka in the province of Omasuyus, La Paz. At seven years of age, he learnt to speak Spanish, and finished his secondary school diploma en 1980 in nearby Huarina. “In our third year, a philosophy professor made us read Georges Politzer (a Marxist thinker) as an extracurricular activity -recalls Choquehuanca-. We were questioning things and wanting to organize, and our professor perceived this anxiousness of ours. Sometimes we would meet to discuss the situation in our country. We learnt about historical materialism, the dialectic, we read the Communist Manifesto, and a part of Capital. And I began to feed the desire for struggle and the search for a more just and equal society”. He went to La Paz to study philosophy, but only lasted one year in the Simón Bolívar University, where together with his colleagues, he formed the TREN movement (University Students’ Revolutionary Line). His studies were gradually left aside in order to devote himself to social and political activity, participating in protests, hunger strikes, road blocks and also the meetings of the Central Obrera Boliviana (COB). In 1985 he received a grant from the Vicente Pérez Noa School for Management Training in Havana. It was here that he learnt more about philosophy, about the basic elements of political economy, the history of the international trade union movement, and the history of the Cuban Revolution. “This lasted six months, and it was the only period in which I had access to systematic training”, says the minister. Choquehuanca worked for the next 15 years in an NGO, running the Nina program (a word which means “fire” in Aymara and Quechua), designed for the organizational training of indigenous campesina women, the recovery of communitarian knowledge and the development of new forms of knowledge. It was from these activities that the movements and political proposals emerged. “That’s how I was trained. And I got to know all the leaders on a national level, those already around, and those born later”, he says. In the last six years, before assuming his current government post, he was an assistant to indigenous organizations and parliamentarians. During this time, he completed a post-graduate degree in history and anthropology as well as a higher diploma in indigenous rights in the Cordillera University.